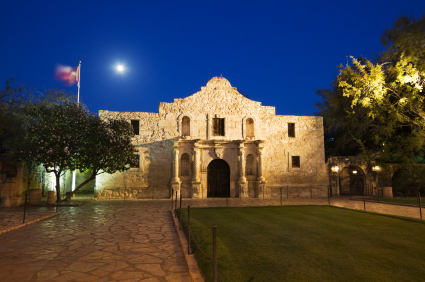 Texian soldiers who attacked Santa Anna and his army were the people who said the quote, "Remember the Alamo." The Alamo was once a Spanish mission that was turned into a battleground for Texas independence. Mexican soldiers, led by Santa Anna, outnumbered, attacked, and defeated the Texans and Tejanos who sought refuge in the mission. The quote, "Remember the Alamo" was the war cry of those soldiers who later attacked and defeated Santa Anna. Construction on the Mission San Antonio de Valero, also known as the Alamo, began in 1724. The missionaries and Native Americans who had converted lived there and worked the land peacefully for seventy years until the Spanish authorities gave the land back to the people. Again, they continued to work the land until the mid 1800s when the Alamo and the San Antonio area would play an important role in the fight for Texas' independence. February 23, 1836 - Antonio Lopez de Santa Anna reaches San Antonio with a regiment of the Mexican Army. The Texans and Tejanos are forced to retreat into the Alamo Mission, which was previously stocked with supplies from the Mexican Army. March 6, 1836 - Santa Anna attacks the Alamo with his forces. The standoff takes thirteen days but in the end, all of the Texans inside the Alamo are killed. However, women, children and one slave escape the carnage. April 21, 1836 - The Texian army meets Santa Anna's forces at San Jacinto and defeats them. It is at this battle that the quote, "Remember the Alamo" originates. This battle also marked the end of the land battle for the Texas War of Independence. "Who Said the Quote \"Remember the Alamo\"?." YourDictionary, n.d. Web. 20 April 2019. <https://quotes.yourdictionary.com/articles/who-said-the-quote-remember-the-alamo.html>. Texian soldiers who attacked Santa Anna and his army were the people who said the quote, “Remember the Alamo.” The Alamo was once a Spanish mission that was turned into a battleground for Texas independence. Mexican soldiers, led by Santa Anna, outnumbered, attacked, and defeated the Texans and Tejanos who sought refuge in the mission. The quote, “Remember the Alamo” was the war cry of those soldiers who later attacked and defeated Santa Anna.